Professor Thomas Buergenthal, Lobingier Professor of Comparative Law and Jurisprudence at the George Washington University, exchanged opinions with FNF representative from Brussels and Washington D.C about developments in the field of Human Rights on an international level. 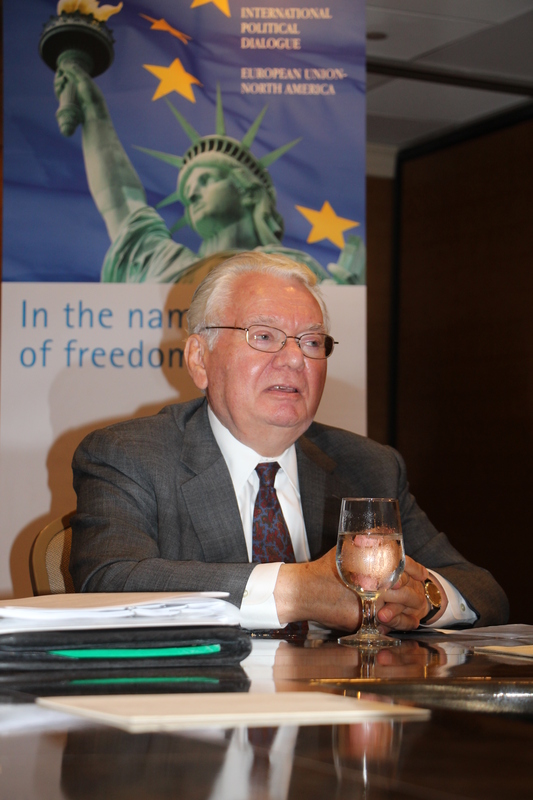 Prof. Buergenthal is considered one of the world’s leading international Human Rights experts. He was a judge and President of the Inter-American Court of Human Rights as well as President of the Administrative Tribunal of the Inter-American Development Bank and served on the International Court of Justice in The Hague. Professor Thomas Buergenthal, Lobingier Professor of Comparative Law and Jurisprudence at the George Washington University, exchanged opinions with FNF representative from Brussels and Washington D.C about developments in the field of Human Rights on an international level. Prof. Buergenthal is considered one of the world’s leading international Human Rights experts. He was a judge and President of the Inter-American Court of Human Rights as well as President of the Administrative Tribunal of the Inter-American Development Bank and served on the International Court of Justice in The HagueAccording to Prof. Buergenthal, the establishment of the International Criminal Court (ICC) and the European, Inter-American, and African International Human Rights Commissions, contributed greatly to the improvement of the Human Rights situation in the world. Before these courts were established, only governments were held responsible for Human Rights violations, not individuals. Now states, as well as individuals can be held accountable for Human Rights abuses. In addition, the creation of a number of UN institutions, for example the UN Human Rights Committee, with its nine UN human rights treaty bodies, have helped to improve the Human Rights situation worldwide. International institutions are keeping an eye on governments, thus preventing regimes from committing Human Rights violations. Prof. Buergenthal also portrayed the challenges to amnesty laws in El Salvador, Argentina and Guatemala. In the case of El Salvador a decision of the Inter-American Court of Human Rights ordered a reversal of the amnesty law, raising the possibility that crimes committed during the civil war may be prosecuted after all. On the downside, the recent developments and setbacks in Libya, Syria, Tunisia, and Egypt challenge the global Human Rights situation immensely and terrorism has created new threats and questions to the Human Rights discourse. The biggest challenge within this framework is to counter terrorism while protecting Human Rights. Prof. Buergenthal considers the fact that the US is not part of the ICC as a big mistake. He stressed that it is very important for the US to be a participant of the ICC and hopes that the US will ratify the Rome Statue in the near future. He also addressed worrying developments in Latin America, where the Inter-American Human Rights System (IAHRS) is being attacked because a group of states – primarily Brazil, Colombia, Ecuador and Venezuela – are trying to restrict its mandate. Finally, Prof. Buergenthal summarized that the global Human Rights situation has improved, however, there is still a lot of work left to be done and the FNF can play an active part in improving the situation in its project countries worldwide. The implementation of Human Rights is a slow and lengthy process that requires patience. But, through education and the promotion of a mutual understanding, a lot can be achieved. ← Will the US – EU free trade deal fly?